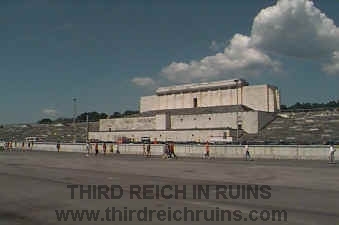 The Third Reich in Ruins ... This page presents photos of historical sites associated with Germanys Third Reich (1933-1945), both as they appeared while in use, and as the remains appear today. These photos give a "then and now" perspective, in many cases, a virtual tour of the sites. I was originally inspired to write this page by a collection of photos taken by my father, U.S. Army Air Forces Lt. Delbert R. Walden, when he was stationed in Germany in 1945-46. Click here to see UPDATES added since 20 July 2000 (latest update 13 October 2018). Click here to visit a detailed table of contents page, set up to allow searching the entire site by keyword. Note: Use the MapQuest® or Google Maps® location links on the pages for zoomable maps of these locations. To view these sites in Google Earth®, go to the MapQuest® or Google Maps® map then enter the coordinates found there in the Google Earth® "Fly To" block. Berchtesgaden and the Obersalzberg -- In the 1920s Adolf Hitler established a mountain home for himself on the Obersalzberg, above Berchtesgaden, in the southeast corner of Bavaria. Later, the Nazi hierarchy turned the Obersalzberg into a huge complex, with rustic (and not so rustic) homes for themselves, a palatial home for Hitler called the Berghof, military barracks, tunnel and bunker complexes, and even the famed Kehlsteinhaus, or "Eagle's Nest." "Hitler's Berchtesgaden" is available at Amazon and other retailers (the Kindle version is also available from Amazon). Berlin -- The former Third Reich capital features many examples of Nazi architecture and historical significance. Part 2 shows the area of the site of Adolf Hitler's death and burial at his Führerbunker, sites where his body was autopsied and later buried by the Russians, the site of Martin Bormann's death and burial, and Horst Wessel's grave. Includes subpages on the 1936 Olympic Games in Berlin and the Olympic Village site, Tempelhof airport, Lichterfelde SS Barracks, proving grounds and rocket test site at Kummersdorf, and the Army Command bunkers at Zossen/Wünsdorf. Munich -- Birthplace of the Nazi Party - features subpages on the Nazi buildings Führerbau, Verwaltungsbau, and Ehrentempel on the Königsplatz, original Nazi office locations, Hitler's Munich residences, and art exhibits at the Haus der Deutschen Kunst. Nürnberg (Nuremberg) -- Hitler turned the city into a sort of Nazi pilgrimage site, for the annual Nazi Party Day rallies in the 1930s. Schweinfurt -- This industrial city and ball bearing manufacturing center was a key target for the U.S. 8th Air Force and was heavily bombed during the final 18 months of the war; also features the Luftwaffe Munitions Depot at Rottershausen. Würzburg -- This Baroque city had many beautiful rococo buildings, sites for Nazi rallies and severely bombed in 1945. Weimar and Dresden -- These two German cities boasted several Third Reich building projects. Tegernsee -- This mountain lake south of Munich was the location of several Third Reich sites. Garmisch-Partenkirchen -- The 1936 winter Olympic Games were held in Garmisch (includes sections on the nearby Eschenlohe and Oberammergau tunnel systems). Chiemsee -- Site of the first Rest House of the Autobahn system, opened in 1938. Adolf Hitler Visits His Homeland -- Hitler visited Austria in March 1938, following the Anschluss; also features Hitler's visit to Vienna and Hitler's visits to Czechoslovakia in 1938 and 1939. Auschwitz-Birkenau -- The infamous concentration and extermination camp complex in Poland. Dachau -- The first Nazi concentration camp, located near Munich. Buchenwald -- One of the most sinister Nazi concentration camps has been preserved as a monument to the victims of German Fascism. Nordhausen -- Underground complex for building V-1 and V-2 rockets, with the associated Mittelwerk tunnel remains and Dora concentration camp memorial site. Flossenbürg -- Concentration camp site in Bavaria - site of the execution of Wilhelm Canaris and Dietrich Bonhoeffer. Mauthausen -- Concentration camp site in Upper Austria - includes subcamp at Gusen and underground factory project B-8 "Bergkristall" at St. Georgen. Ebensee -- Underground factory/refinery site (codename "Dachs/Zement") and concentration camp site in Austria. Mühldorf -- Project "Weingut" underground factory site for Me 262 jet aircraft manufacture. Ordensburg Vogelsang -- One of the three specially constructed "Order Castles" for training Nazi Party functionaries. KdF Seaside Resort at Prora-Rügen -- The largest construction project of the Third Reich was a "Kraft durch Freude" workers resort on the Baltic Sea island of Rügen. Wolfschanze / Wolf's Lair -- Hitler's military command complex on the Eastern Front, with the associated Army High Command headquarters Mauerwald, now in Poland. Anlage Mitte / Anlage Süd -- Protected bunkers and tunnel for Hitler's headquarters train, in Poland. Project "Riese" (Giant) -- A series of tunnel systems begun toward the end of the war, which may have been meant for a Führer Headquarters. Underground Sites in Thüringen -- The final year of the war saw increased construction of underground facilities for production of secret war materiel and for headquarters - features the REIMAHG Me 262 jet factory near Kahla, an underground fuel production site near Berga ("Schwalbe V"), and the Jonastal "Siegfried/Jasmin" project near Ohrdruf. End of the War for s.PzJg.Abt. 653 -- "Jagdtiger" (Hunting Tiger) vehicles where they were destroyed or immobilized in March 1945 in the Mannheim-Heidelberg and Munich areas. End of the War in the Main-Spessart Region -- Heavy fighting in March-April 1945 in towns along the Main River, between Aschaffenburg and Schweinfurt/Würzburg; includes a section on Hammelburg and Task Force Baum. Miscellaneous -- Various other Third Reich sites - Bad Berneck, Black Forest, Lambach, Linderhof, Mangfall Bridge, Bergen Bridge, Holledau Bridge, Stuttgart, Kaiserslautern, Ludwigshafen, Heidelberg, Bamberg, Kitzingen, Ochsenfurt, Stadtilm, Doggerwerk, Hirschbachtal, Bayreuth, Marktzeuln, Kronach, Tondorf, Hirschberg, Jena, Michendorf, Eichstätt, Neustadt, Ziegenberg, Giessen, Heilbronn, Windecken, Bayrischzell/Sudelfeld, Kelheim, Vilsbiburg, Coburg, Aschaffenburg, Oberwildflecken, Fladungen, Urfeld, Pleikershof, Ansbach, Münchberg, Uslar, Goslar, Braunschweig, Fürth, Herrsching, Veldenstein, Muggendorf, Grafenwöhr, Mindelheim, Bad Godesberg, Erwitte, Erlangen, Koblenz, Wewelsburg, Rechlin, Peenemünde, Kochel am See, Mittenwald, Regensburg, Steinhöring, Lohr am Main, Frankfurt am Main, Sassnitz (Saßnitz), Feilitzsch, Geretsried, Deiningen, Heuberg, Carinhall, Ravensbrück, Dinkelsbühl, Rothenburg, Ansbach, Lichtenau, Adolf Hitler Koog, Radolfzell, Haigerloch, Bückeberg, Bremen, Teutoburger Wald, Germersheim, Ellingen, Biburg, Augsburg, Landsberg, Kaufering, Erlenbach, Tannenberg (Poland), Ratibor (Poland), Masurian Canal (Poland), Saint-Marcouf (Normandy), London, and others. Reichsadler -- A photo listing of Nazi Eagles that still exist today on buildings, plus some other surprising building decorations. 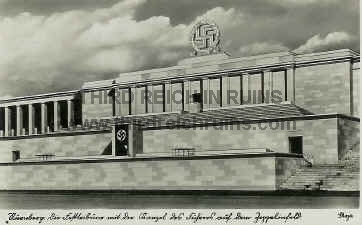 Thingplatz / Thingstätte Sites -- The Nazi "Thing" movement was part of Propaganda Minister Josef Goebbels' ideology. Several amphitheaters were built across Greater Germany to host "Thing" gatherings. Many of these are still in use today as local festival and concert sites. Wehrmacht Military Posts -- One of the largest ongoing Nazi building projects resulted in military barracks all over the Third Reich. Many of these posts still exist and some have interesting reminders of their original occupants. German War Memorials -- Photos of several war memorials and monuments in Germany. Cold War Sites -- In addition to the Third Reich sites, this page features some sites left over from the Cold War, including ruins of some East German and American border posts. To view some of these sites as a multi-media presentation, fading the photos from "then" to "now," visit Bob Stell's excellent "WW2 Remembered" page. NOTE: My brother and I have been unable to identify the locations of several of our father's 1945-46 photos. These are shown on the "Lost Sites" page. Anyone who can identify any of these is asked to contact the page author. Links -- Click here for a listing of links to other useful Third Reich associated webpages.